It was love at first sight when, a good twenty years ago, David Matthews discovered the legendary Eden Rock Hotel on its striking perch from his vantage point on a yacht in St. Jean Bay. Today it ranks among the top 100 hotels in the world. The English entrepreneur on the bold vision that transformed his establishment into one of the best on this most glamorous of Caribbean islands. Welcome to Saint Barthélemy, or St. Barths for short. The island is many things to many people: 21 square kilometers of natural paradise, a haven for the rich and megarich, a party location for the beau monde. Leonardo DiCaprio is a regular, as are Beyoncé and Sharon Stone. Bill Gates has a house here and Paul McCartney is on the island with wife number three to recover from wife number two. So why do they all come? The island is beautiful, the atmosphere relaxed. The infrastructure is good, crime non-existent. For the island’s many well-to-do visitors, those are important factors. Hardly anybody so much as turns their head when a celebrity goes by. Hotels are few, but good. Most vacationers rent a house – hardly a cheap option considering prices start at 10,000 euros a week. The island, which is part of the Lesser Antilles, was discovered by Columbus in 1493 and named after his brother Bartolomeo. Later it belonged to France, until Louis XVI sold it to Sweden’s King Gustav III. 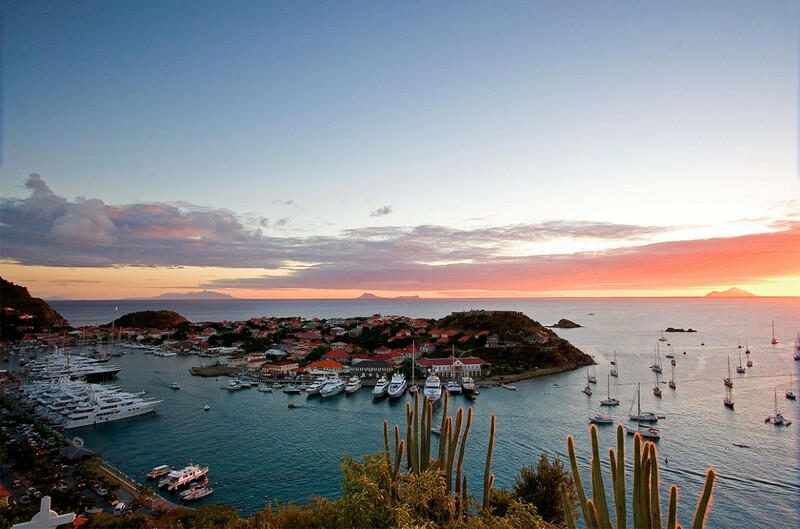 The capital – a picturesque harbor town – has been called Gustavia ever since. 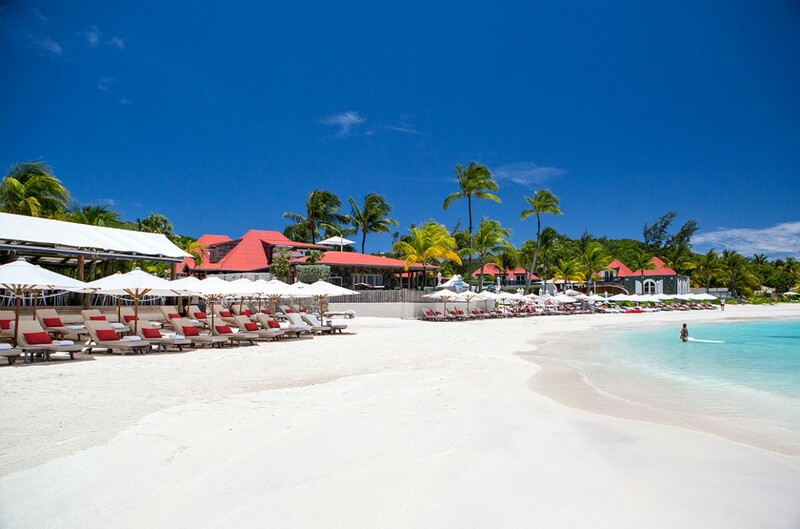 A nice reason for King Carl Gustav and Queen Silvia to visit the island from time to time, even though St. Barths was given back to France in 1877. Haute cuisine in the Caribbean – it doesn’t get any better than that! Nowhere else in the Caribbean can you eat as well as on St. Barths. Michelin-starred chefs fly in from France on a regular basis, on a culinary mission to spoil their discerning guests. It’s almost impossible to get a table at one of the island’s 60 restaurants without making a reservation first. So having lunch with David Matthews at his Eden Rock Hotel is a bit like winning the jackpot. And very entertaining, too! Tall, athletic and casually dressed in a polo shirt, Mathews meets me at the Eden Rock’s beach restaurant and starts off by ordering “the best white wine we have.” The way he says it doesn’t sound the least bit big-headed, just genuine. The legendary Eden Rock Hotel, which is perched on a big rocky outcrop in St. Jean Bay, has been given a new lease of life. And it’s all thanks to David Matthews. 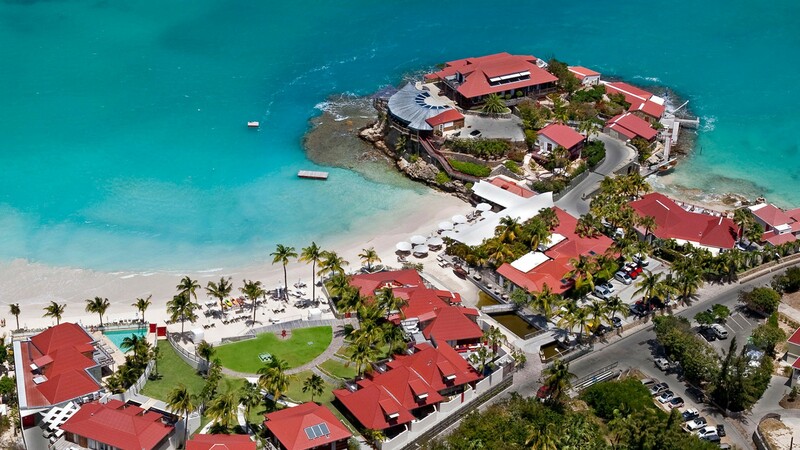 A good twenty years ago, the native of England was on a yacht in the Caribbean when he noticed the striking rocky outcrop topped with a hotel in St. Jean Bay. By the mid-1990s, the Eden Rock was well and truly past its heyday, the hotel and its outbuildings in poor repair. But that didn’t stop Matthews from recognizing the property’s potential straight away. The trained car mechanic from Yorkshire had made his fortune with busses. “It was a real stroke of luck,” reminisces the Brit. “I’d just sold part of my company and my wife and I were ready for a new adventure.” Adventure is precisely what they got – and plenty of it! The family dedicated the next ten years to rebuilding the hotel. ­David Matthews planned and supervised the construction work and the extension, while Jane Matthews furnished the rooms, giving each a totally different look. Up until two years ago the couple lived in the hotel themselves – their children flew the nest a long time ago – moving from room to room and suite to suite depending on what happened to be free at the time. Living like nomads in their own house didn’t bother them in the slightest, says David Matthews, looking back: “It was the best way to test the rooms for our guests.” Two years ago, Matthews brought the German Oetker Collection on board, which includes other illustrious hotels such as the Brenners Park Hotel in Baden-Baden, Germany and the Hotel du Cap-Eden-Roc in Cap d’Antibes, France. A whole army of accommodating Oetker staff now takes care of guests’ every need, giving David Matthews the chance to take things a little easier. But the Eden Rock was originally created by someone else. Rémy de Haenen must have been a pretty unique character – adventurer, gentleman and smuggler, all rolled into one. And on top of everything else, he was an unusually talented pilot as well. In 1945, as the islanders and a few goats looked on in amazement, he landed the first plane ever to touch down on St. Barths on a bumpy strip of grass. Having bought the rock for just 200 dollars in 1953, the London-born son of a Dutch father and French mother began building the island’s very first guesthouse with his own hands and decided to name it Eden Rock. And because he was such a colorful character and charming host, the beau monde of the day was soon flocking to his hotel: Begum Aga Khan, ­Johnny Weissmuller, Jacques Cousteau, Greta Garbo and the Rockefellers all numbered among his guests. In fact, David Rockefeller fell so much in love with the island that, as befits a Rockefeller, he bought a huge peninsula off of St. Barths, built a beautiful villa on it and then proceeded to throw legendary parties. 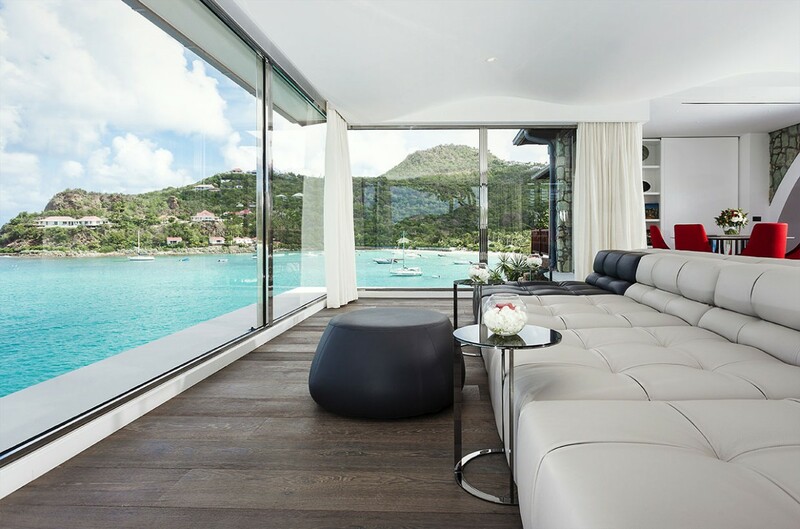 As a result, even more rich and famous guests began flocking to the island, and establishing St. Barths as a mecca for the jet set. The most expensive vacation home on the island is Villa Rockstar, which belongs to the Eden Rock. Located right on the beach and measuring 1,500 square meters, the white villa accommodates up to 12 people and boasts its own private garden and infinity pool. The walls are hung with genuine artworks and the basement features a sound studio with the original mixing console that John Lennon recorded “Imagine” on in 1971. The villa costs 15,000 euros a day to rent; ­Leonardo DiCaprio celebrates New Year’s Eve here every year.